Most of the episodes involve some fight scenes that allow the superhero to use his/her powers to overcome their enemies. Some notable villains such as: Lex Luthor, Grundy and Red Robin make returns in this series. Most of the villains shown also have superpowers that make the heroes jobs that much more challenging. With the new episodes many new questions are raised as to the relationship between the Justice League and the citizens of earth. Some of the earthlings believe that the government should protect them against the super powered vigilantes for fear of being enslaved by them. Other see the Justice League as a beneficial and necessary part of life. These two different beliefs lead to many confrontations between the government and the Justice League. Cadmus is the government's (insurance) against any possible attack by the Justice league. Unlike, the first series this one has a more political and serious undertone.Cadmus has been creating anti-superhero technology that could stop even the likes of Superman if the need should ever arise. With these new weapons the Justice League begins feeling, feelings of worry about their relationship with the public. As, the series progress different member of the league drop out because of their beliefs and the League is in a constant state of disarray. After saving a distant planet, the Justice League returns to Earth just in time for Christmas Eve. While Flash plays Santa for some orphans, Superman invites J'onn home to celebrate the holidays in Smallville. The Shadow Thief returns and so does Hawkman as more mysteries from Shadow of the Hawk are explored. Supergirl, Green Lantern and Green Arrow travel into the future where they meet the Legion of Super Heroes and their enemies The Fatal Five. Roulette starts Metabrawl again, this time with an all-female fight card made up of Justice Leaguers. A mystical accident leads to Lex Luthor and the Flash's minds being swapped. When an out-of-control super soldier threatens Metropolis, Green Arrow leads seven nonpowered Justice Leaguers, including Crimson Avenger and Shining Knight, in a battle they can't hope to win. The ghost of a circus performer convinces Superman, Batman and Wonder Woman to help him retrieve the stolen souls of a mystic order of monks. Batman and Orion see a different side of the Flash when a rogue's gallery of villains attacks the museum that is opening in the Flash's honor. Wonder Woman stumbles onto a plot to steal the powers hidden inside the 3,000-year-old, frozen remains of the legendary hero Viking Prince. Supergirl, Stargirl and Green Lantern go to Skartaris, the fantastic, hidden world at the Earth's core, to help free it from the rule of a brutal dictator. Batman is suspicious of Shayera's new boyfriend, a mysterious archeologist with sinister ties to her Thanagarian past. Lex Luthor escapes from a maximum security prison, only to be invited to join Grodd's unstoppable Legion of Doom. Fifty years in the future, the history of the Justice League is the key to Batman's darkest secret . . . and his final destiny. With most of the Justice League incapacitated, who will be left to stand against the League's deadliest enemies? With the founding members out of action, the remaining 50 heroes fight to survive Cadmus' ultimate attack on the Justice League. To avenge a fallen comrade, Superman declares war on Cadmus. The Question discovers a secret that threatens to shake the very foundations of the Justice League. Responding to a deep space distress call, Shayera leads her reluctant teammates Vigalante and Vixen into a deadly trap. Before Superman can even try to stop Lex Luthor's latest plot, he'll have to get past the world's mightiest mortal, Captain Marvel. Green Arrow and Black Canary race to stop The Question and Huntress from killing organized crime lord Tobias Whale. Wonder Woman and Hawkgirl must put aside their feud and go to the depths of Tartarus when the evil sorcerer Felix Faust establishes dominion over Hades. Five incarcerated supervillains are offered suspended sentences if they can survive an impossible mission: steal a deadly weapon from the Justice League's satellite headquarters. While Superman battles Doomsday in the heart of a volcano, Batman discovers an elaborate conspiracy to destroy the Justice League. The world's greatest escape artist needs help from the Flash in order to break a deadly enemy out of an inescapable prison on a harsh alien planet. Black Canary convinces Green Arrow to help save her mentor, the Wildcat, from his involvement in an underground, superpowered fight club. When Solomon Grundy rises from the grave, an old friend must come out of hiding and team up with the League once more. When the entire League is helpless to stop an alien invasion, the world's only hope is the Atom, a microscopic superhero. The Justice League meets "The Ultimen," a popular group of young heroes who are about to discover their own horrifying secret origins. Nearly two-dozen heroes join forces to prevent an all-powerful Android from reaching his goal, the recently reformed Lex Luthor. The Justice League is in an epic battle with Mordru in downtown Metropolis, but the real story is what happens to Booster Gold while he's supposed to be controlling the crowd. Supergirl discovers that a series of nightmares she's having about being an assassin may be far more than just a bad dream. It's musical mayhem when Batman and Zatanna join forces to save a teammate from a fate worse than death. Wonder Woman teams up with two super powered brothers, one warlike, the other a pacifist, to stop Ares' plans to escalate a European civil war into World War III. Superman, Batman, Wonder Woman and Green Lantern are transformed into 8-year-olds in a desperate attempt to save the world from the magic of Mordred! Batman and Wonder Woman visit the fortress of Solitude on Superman's birthday, only to find him trapped by Mongul. A reluctant Green Arrow joins forces with the new Justice League to stop a rampaging nuclear monster in Asia. 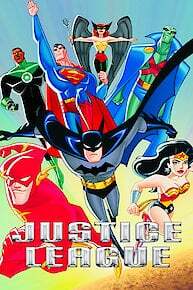 Justice League Unlimited is currently available to watch and stream on Cartoon Network. You can also buy, rent Justice League Unlimited on demand at Amazon, Vudu, DC Universe, FandangoNow, Google Play, iTunes online.